This review first appeared in Turbula in June 2006. Jazz bassist Bob Magnusson is a regional treasure to the locals in San Diego. Born and raised in Point Loma, Mag was hired as a young man to hold down the bass chair in the big band of legendary drummer Buddy Rich. He later played behind the equally legendary Sarah Vaughan. If he lived in New York or Los Angeles, Magnusson would be regarded as among the very elite of the jazz world. But he doesn't; he lives in San Diego, and so toils in relative anonymity. And so when Magnusson releases a new CD under his own name  for the first time in 20 years  it is an event well worth noting. That is particularly true when the album is as stellar as "Liquid Lines." 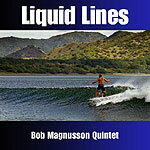 Occasionally experimental, consistently accessible and always virtuosic, "Liquid Lines" is Magnusson's finest work as leader (admittedly a far too-small category). Of course, much of the credit for the magic found here is due to those with whom Magnusson is smart enough to surround himself. Having the likes of Peter Sprague (guitar), Tripp Sprague (sax), Duncan Moore (drums) and Randy Porter (piano) was probably the biggest part of Magnusson's success as leader on this date. Another part of that success is the surf-based groove surrounding this album  it is cast as a descendant of the jazz soundtracks Bud Shank wrote for Bruce Brown's pioneering surfing flicks "Slippery When Wet" and "Barefoot Adventure." If completely unrelated to rock 'n' roll surf music a la Jan and Dean and the Beach Boys, "Liquid Lines" nevertheless has the ambience of a day at the beach. In that, it shares much of its groove with many of Peter Sprague's recordings, most of which Magnusson has been part of. But where Sprague's music has a huge Latin streak running through it, particularly Brazilian, Magusson's is much more straight-ahead, just with a light touch and a sense of fun about it.